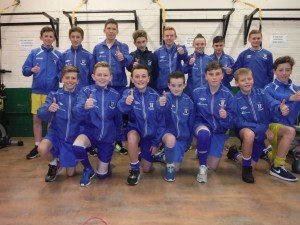 This week it has been confirmed that Collinstown FC under 14’s will have their tracksuits sponsored by DB Sports Tours. This of course isn’t the only such sponsorship announced, as only last week it was announced DB Sports Tours will be the sponsors of Shelbourne Youth Academy and also helped ST.Kevins U16’s Premier during their summer tour of Barcelona sponsoring their first home kit as well as the double all Ireland winners ST.Francis FC’s tracksuits. Collinstown F.C. under 14’s will be donning their new shirts in April when they travel to Spain for a visit to the home of Catalan Football at Futbol Salou sports complex. Below are a fantastic collection of photographs with the team showing off their new shirt.